On this date in 1661, the restored English monarchy made an end to the interregnum’s religious crazies. A few other images of Thomas Venner are available here. “It is difficult in these days to follow with patience, or even with complete seriousness, all the ramifications of Fifth Monarchy speculation,” writes historian Louise Fargo Brown, whose gratis tome The Political Activities of the Baptists and Fifth Monarchy Men in England proceeds to do just that. This blog wants for both patience and seriousness, so we’ll sum up that Venner et al were the holy rollers of the day, the true whack-jobs in the millenarian hustle of Cromwellian England. Venner himself was born in New England, and there’s a zippy bio of him in The New England Historical and Genealogical Register. The North American colonies and Parliamentarian Britain helped to incubate political/religious heterodoxy for one another, and Venner was not the only budding religious zealot in the distant marches to emigrate to London after Charles I lost his head. There the cooper became an outspoken apostle of the Fifth Monarchists, a part of Cromwell’s coalition made for disappointment with the mundane machinations of statecraft. Relieved in time of any a share in General Ironsides’ burden of helming the state in choppy waters, the men of the Fifth Monarchy were at liberty, to retire with their slide rules and philosopher’s stones to calculate the (imminent) date of the apocalypse foretold by Daniel and pursue the maxim not yet born that, starting with a mistake, a remorseless logician can end up in Bedlam. All well and good to mock from posterity, and from a country where Left Behind is a bestseller no less. To be fair to the Monarchy Men, one could as well say that the egalitarian political language of these “arrant Radicals and levellers” just happened to be scriptural. * They would hardly be the last to foretell a golden age made ready by the slaying of a king, not by a long shot. 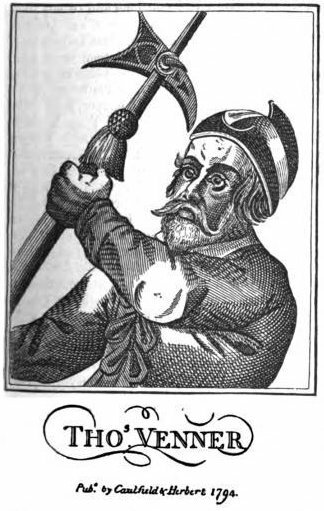 At any rate, our Bostonian tradesman became such an outspoken prophet of the return of “King Jesus” that Cromwell was obliged to clap him in irons. Venner didn’t take the hint well, nor other more salutary warnings, and Venner instigated a riot of his few dozen followers at the start of January 1661 that took London unawares and did some damage before it was put down. [a] thing that never was heard of, that so few men should dare and do so much mischief. Their word was, “The King Jesus, and the heads upon the gates.” Few of them would receive any quarter, but such as were taken by force and kept alive; expecting Jesus to come here and reign in the world presently, and will not believe yet but their work will be carried on though they do die. Thomas Venner and his compatriot Roger Hodgkins died that traitor’s death this day, along with William Oxman and Giles Pritchard, the latter two having their sentences commuted to simple hanging and posthumous beheading. The remaining survivors of his band climbed the scaffold two days later. Part of the Themed Set: Resistance and Rebellion in the Restoration.